August 31, 2011 By Mike Seeklander & filed under All Articles, Defensive Training Concepts. I am often asked what gun I like best, and although I answer the question, I wish people would shift their thinking. While I do understand why people worry about gear (and that’s why I always answer the question), what really piques my interest is when someone asks how I think they should train. Training is applicable across the board to any weapon, including non-firearms-related training. The old adage about “perfect practice” is great, but simplifies the matter much more than we should. This article will focus on developing your own training program, and hopefully you can use these suggestions to guide your skill development and change your thinking. So you finally got that Smith & Wesson M&P you’d been drooling over … now what? You’re all set and it’s time to shoot, right? Actually, yes it is, but is it really that easy? Will just having a great gun be the answer you’re looking for, or is there something more? Should your focus be on the gun and gear, or something else? You certainly have a choice to be one of those folks who has more guns than they can possibly train with, and can care less about any level of skill. Or maybe you just want to go plinking now and then (nothing wrong with that). But if you’re reading this article, it’s likely that you want to develop a certain level of skill with that firearm. You may plan to carry it defensively, and it might save your life. I’d bet skill is what you seek. Taking a class from a qualified instructor will get you on the right track by teaching you correct technique. Certainly I would love it if you took that class from me, as training is my business, but truthfully I am just as happy if you find quality training from someone who can give you the technical pointers that might save your life. If you are very new to shooting, you may not know what you don’t know. You may think you have the knowledge and experience to practice the right techniques correctly when you train, but chances are you will be missing key pieces of the puzzle. If I were to ask almost any alumni of courses I have taught if they realized during or after the class that they knew a whole lot less than they thought they did, the answer would likely be yes. Trust me when I tell you that understanding how to perform techniques correctly is an important key in building your training/practice program. Remember, if you practice something wrong, you will get it wrong when you need to use that skill. Ingraining skills is a serious and expensive process, so make sure you have the information you need to do it right the first time. The key here is to figure out what you want to accomplish with that new gun, and a big part of that will be determining, if you don’t already know, what the gun’s intended use will be. Is it going to be your carry gun for self-defense? How about employing it for dual purposes, such as using it at the next match and carrying it for self-defense? Once you have figured out what your goals are, write them down. Try to set goals that are completely controllable by you, meaning that you have the ability to measure your success or failure to reach them. Be careful to avoid setting goals either too high or without real purpose. Goals can be very simple or complex, depending on what you want to do. Once you have them figured out, write them down! Now decide when you would like to meet your goals. Write that down. It’s a good idea to list some sort of pay value, or a statement that will remind you of why these goals are important to you. This will keep you motivated. A good instructor will catch things and make small changes that will have significant results. After you have decided on a purpose (goal), do some analysis and list the skills you will need to meet that purpose. If you are going to compete with the gun, your list might include the draw, reloads, shooting on the move, etc. 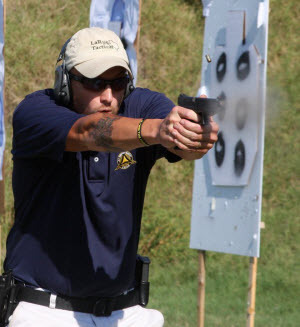 Skills like shooting around cover, with one hand, in a seated position in a vehicle, or under a vehicle may be needed for a self-defense weapon. When you have a list of those skills, prioritize them. You want to spend the most time working on the skills that are most important to your overall goals. Statistics tell us that certain occurrences are common in a self-defense situation, and others are rare. If you’re training for self-defense, you want to be very good at the things most likely to occur. Once prioritized, list the details of each skill. If you have followed my recommendation and taken a class, you should have a pretty good idea about the details of each skill you’re going to train. If not, do some research or take a class so you know you’ll be training the key details right. If taking a class is not possible, another option is to find high-quality training DVDs to guide your technique. Building the training drills that will ingrain the proper skills is something you should not take lightly. If you do not pay attention to this step and make up drills that are improperly or inadequately designed, you’ll end up training wrong and ingraining bad habits. Retraining bad habits is very hard, and with the cost of ammunition, also a waste of your time and money. When you build your drills, I recommend breaking them down into micro and macro drills. To keep things simple, think of micro drills as a small component of a big skill. Let’s use driving a car as an example. Driving is a complex task that involves dozens of things, all of which happen at the same time. If you want to design a micro drill that works on one small component, you might work on braking properly. A macro drill, in comparison, might be working on braking while steering through a corner and accelerating out of that corner, where you have to focus on multiple skills at once. You will be much better served working on small components at a time when training if you are new to the skill you are trying to improve. At my level, I still focus on training with micro drills and the small things within the big picture. The frequency (number of sessions) and duration (length of sessions) of your training sessions will depend on how much time you have and what goals you have set. If your goal is to reach world-class skill, then obviously you will have to devote the necessary training time, which will vary by individual, to do so. If possible, schedule more frequent sessions, even if they are short in length. It is a proven fact that we gain and retain more skills when we train more times per week, even if the training sessions are shorter, than if we train less frequently in longer sessions. Consider modifying your daily schedule (if you can) to allow you more sessions at the range, and you will see an increase in skill. If possible, train at least three times per week, and don’t forget that a training session should also include dry-fire training. You may actually schedule training sessions where you only dry fire, and as long as you are paying attention to the technique while you’re doing it, you can gain skills without firing a single shot. Visualization. This is the act of seeing yourself do something before you do it. Each time, try to actively visualize the drill before you do it. Active visualization will help you improve your ability to see yourself perform well, and then actually perform well. I have found the use of visualization during training and prior to an event to be a common denominator across the board among high-level athletes and tactical operators. Author in competitive training drill. Next step is to log the time and details for future reference. Execute and expand your control zone. Pay attention to this critical point: Each repetition of the drill must be performed as perfectly as you can. You write your subconscious programs here, and if written wrong, you will get wrong when you try to apply those skills under pressure. When going through my training repetitions, I shoot the drill as fast as I can while still in control. Then I begin pushing the pace and trying to go faster while maintaining control. This is what you should be doing, always expanding your “control zone” by trying to go faster and faster while maintaining correctness. Once you start to make mistakes, or the hits on the target begin to impact outside the combat effective area, back off and regain control. Then begin to push again. Stop and correct mistakes. Another key is to stop and correct mistakes mentally before you push on. During my training repetitions, if I make a mistake, I stop, analyze the mistake, and correct it in my mind (by running a correct visualization) before I begin again. Sometimes you will have to stop and focus on one area in a drill to correct something small that you are doing wrong. The point is that you must stop, mentally correct it, begin your training repetitions again, and physically make yourself do the technique right. My logbook is on the barrel. I’m referring to and logging times and details for each drill I do, so I can track and improve my training. Documenting your training sessions is the only way to reflect and find out whether or not you are improving. I also recommend taking a baseline test before you begin your training program so you can track your results over the long term. I have pre-designed forms that I use to track my progress and log my sessions (get them free at www.shooting-performance.com, or email me). You might also consider videoing some of your training sessions. Video will serve as a huge asset when you are trying to evaluate what you are doing right or wrong. This is where you take your notes and videos and do an objective assessment of whether or not your newly designed program is working. Pay attention to the results you are getting by taking another skill test and comparing it to the first one you took. Hopefully your metrics are improving! I always look at video I took of myself and compare it to the notes I took about the event. The video should reflect what I documented–if it doesn’t, there may be a problem with my training program. At this point, modification of the program is critical. If you are not responding to your results and modifying your program as necessary, you will stagnate. I take match notes and use them to guide me to new or modified training drills. You may also have to modify your training frequency and duration, if you find you are training too little to reach the goal you have set. Full Training Design Cycle demonstrates that training improvement should be cyclical in nature. This is not actually a step in building your training program, but I want to make sure you understand that a correct training program should be cyclical in nature. The end of the cycle is the objective assessment of your skills and modification of the program to push the bar higher. Always focus your efforts on moving to the next level or setting a new goal and attempting to reach it. Pay particular attention to modifying your program to ensure you don’t stagnate! That’s it! I recommend writing your program down in a format you can understand and follow. Don’t forget to log all your training and performance sessions (match or real-world event) too. 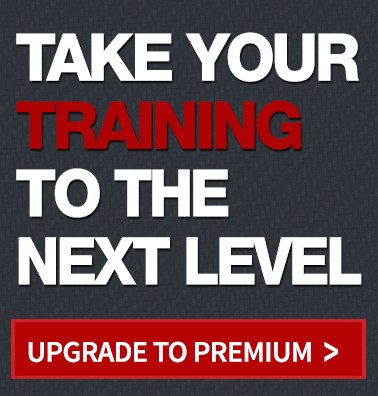 You should now have a solid understanding of how to think about and eventually build your own training program. The sooner you begin to apply these processes, the sooner you will reach your shooting goals! Very good food for thought…being new to the handgun arena I appreciate all the great info here! Outstanding. I do a lot of this already in some form or another but this will really help me tighten up and make the practice more productive.